My leave for 1 day is BURNT ! Guess many people also same as me! People start to travelling go back hometown while so does me! I planned to go back hometown on Friday and people will be doing the same! Argh.. Adding more jam to the highway! Anyways.. Congratulation to HariMau Malaya. Last night i spam my twitter until i hit my daily limit for the day! 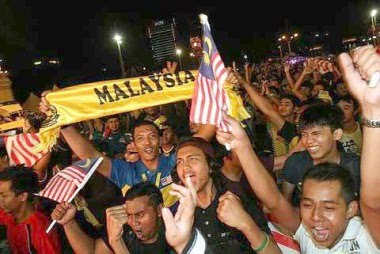 KUALA LUMPUR: Tomorrow has been de-clared a public holiday to celebrate Malay-sia’s first ever victory in the Asean Football Federation (AFF) Suzuki Cup championship. MCA president Datuk Seri Dr Chua Soi Lek said the victory was a timely boost to Malaysian football and all Malaysians were united in cheering the team.